Godot 3 provides a redesigned Environment resource, as well as a brand new post-processing system with many available effects right out of the box. 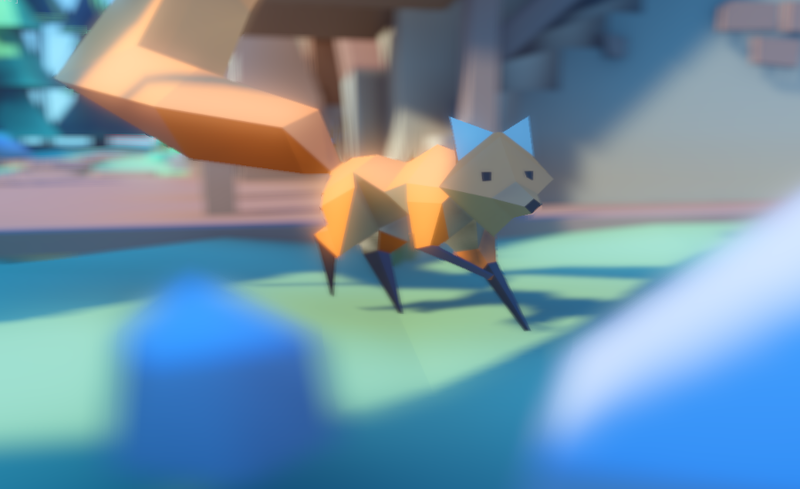 An Environment can be set to a camera. It will have priority over any other setting. 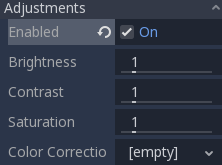 This is mostly useful when wanting to override an existing environment, but in general it’s a better idea to use the option below. The WorldEnvironment node can be added to any scene, but only one can exist per active scene tree. Adding more than one will result in a warning. 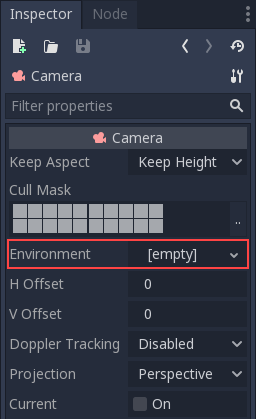 Any Environment added has higher priority than the default Environment (explained below). This means it can be overridden on a per-scene basis, which makes it quite useful. 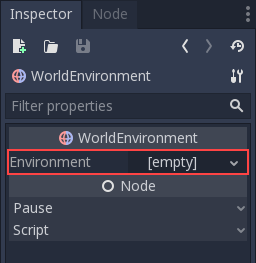 New projects created from the Project Manager come with a default environment (default_env.tres). If one needs to be created, save it to disk before referencing it here. Following is a detailed description of all environment options and how they are intended to be used. The Background section contains settings on how to fill the background (parts of the screen where objects were not drawn). 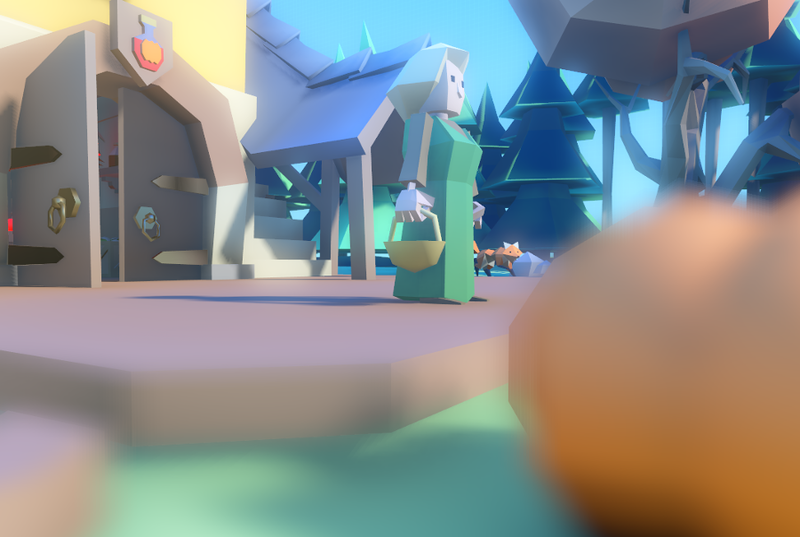 In Godot 3.0, the background not only serves the purpose of displaying an image or color, it can also change how objects are affected by ambient and reflected light. Clear Color uses the default clear color defined by the project. The background will be a constant color. Custom Color is like Clear Color, but with a custom color value. 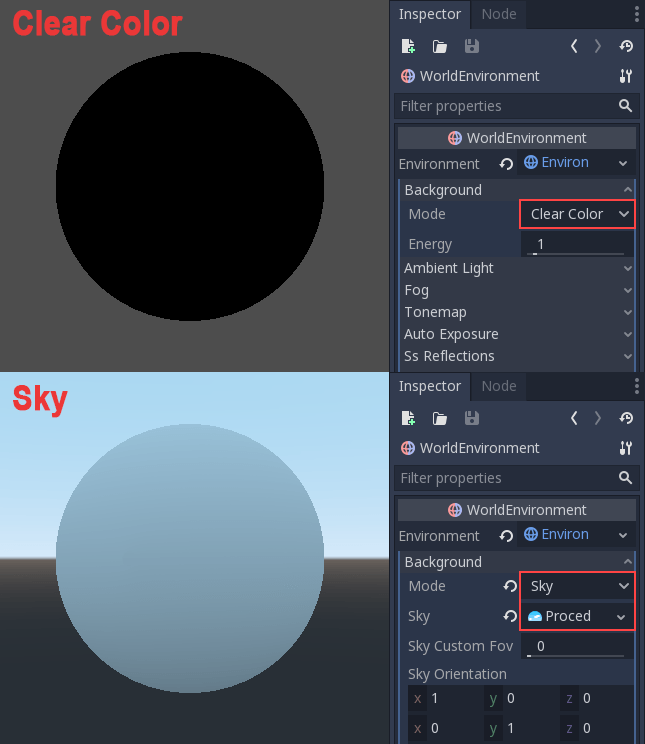 Sky lets you define a panorama sky (a 360 degree sphere texture) or a procedural sky (a simple sky featuring a gradient and an optional sun). Objects will reflect it and absorb ambient light from it. Color+Sky lets you define a sky (as above), but uses a constant color value for drawing the background. The sky will only be used for reflection and ambient light. Ambient (as defined here) is a type of light that affects every piece of geometry with the same intensity. It is global and independent of lights that might be added to the scene. There are two types of ambient light: the Ambient Color (which is a constant color multiplied by the material albedo) and then one obtained from the Sky (as described before, but a sky needs to be set as background for this to be enabled). When a Sky is set as background, it’s possible to blend between ambient color and sky using the Sky Contribution setting (this value is 1.0 by default for convenience, so only the sky affects objects). 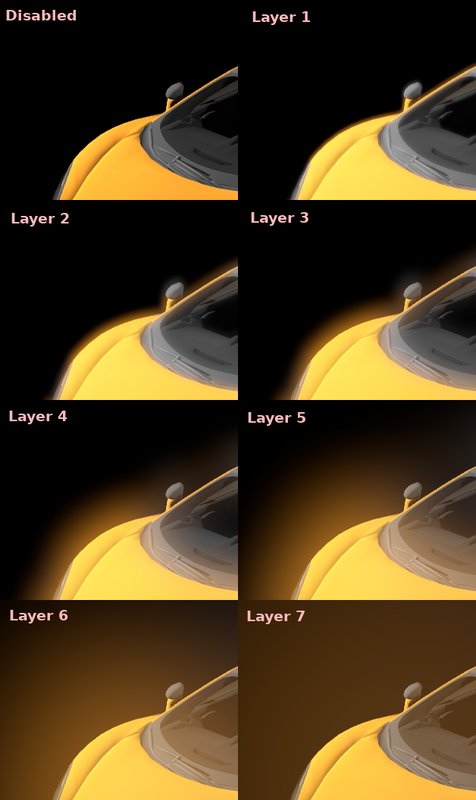 Finally there is an Energy setting, which is a multiplier, useful when working with HDR. Using one of the methods described above, objects get constant ambient lighting replaced by ambient light from the probes. Depth Fog: This one is applied based on the distance from the camera. Height Fog: This one is applied to any objects below (or above) a certain height, regardless of the distance from the camera. Both of these fog types can have their curve tweaked, making their transition more or less sharp. The first is Sun Amount, which makes use of the Sun Color property of the fog. When looking towards a directional light (usually a sun), the color of the fog will be changed, simulating the sunlight passing through the fog. The second is Transmit Enabled which simulates more realistic light transmittance. In practice, it makes light stand out more across the fog. Mode: Tone mapping mode, which can be Linear, Reindhart, Filmic, or Aces. Exposure: Tone mapping exposure which simulates amount of light received over time. 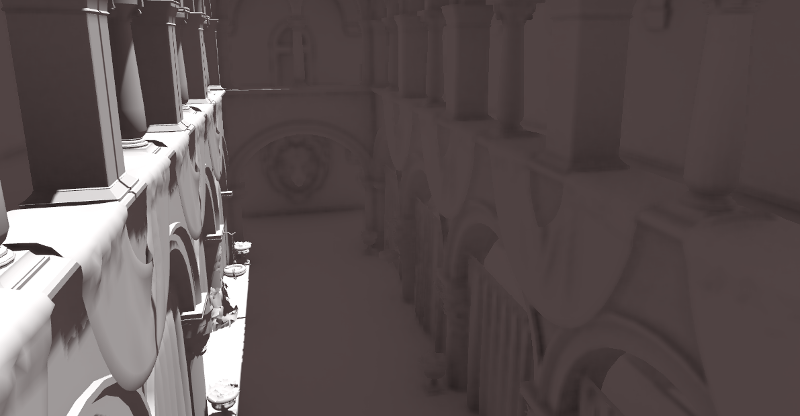 White: Tone mapping white, which simulates where in the scale white is located (by default 1.0). 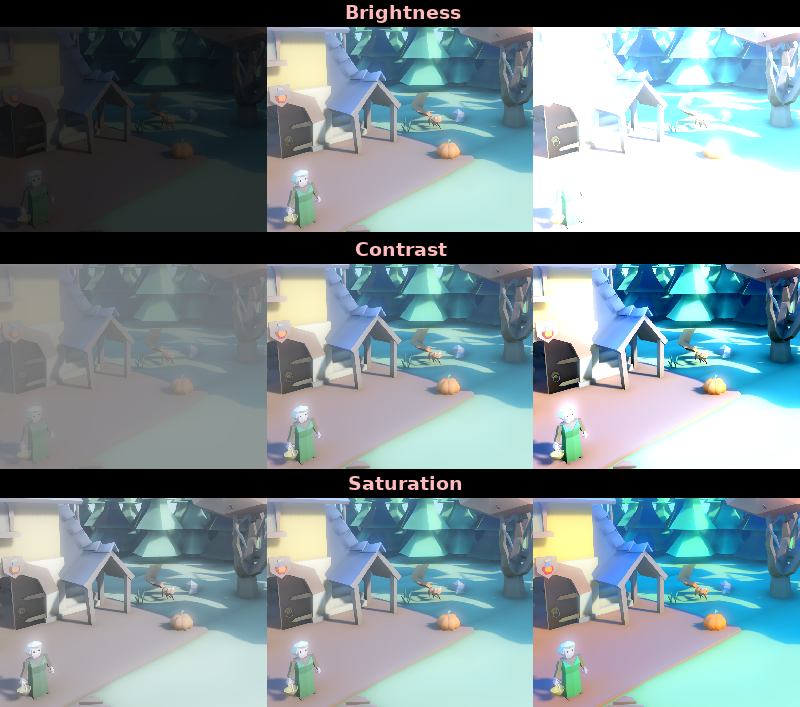 Even though, in most cases, lighting and texturing are heavily artist controlled, Godot supports a simple high dynamic range implementation with the auto exposure mechanism. This is generally used for the sake of realism when combining interior areas with low light and outdoors. Auto exposure simulates the camera (or eye) in an effort to adapt between light and dark locations and their different amounts of light. The simplest way to use auto exposure is to make sure outdoor lights (or other strong lights) have energy beyond 1.0. This is done by tweaking their Energy multiplier (on the Light itself). To make it consistent, the Sky usually needs to use the energy multiplier too, to match with the directional light. Normally, values between 3.0 and 6.0 are enough to simulate indoor-outdoor conditions. 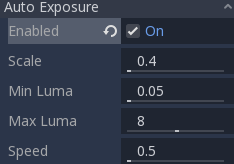 By combining Auto Exposure with Glow post processing (more on that below), pixels that go over the tonemap White will bleed to the glow buffer, creating the typical bloom effect in photography. Scale: Value to scale the lighting. Brighter values produce brighter images, smaller ones produce darker ones. Min Luma: Minimum luminance that auto exposure will aim to adjust for. Luminance is the average of the light in all the pixels of the screen. Max Luma: Maximum luminance that auto exposure will aim to adjust for. Speed: Speed at which luminance corrects itself. The higher the value, the faster correction happens. A large amount of widely-used mid- and post-processing effects are supported in the Environment. 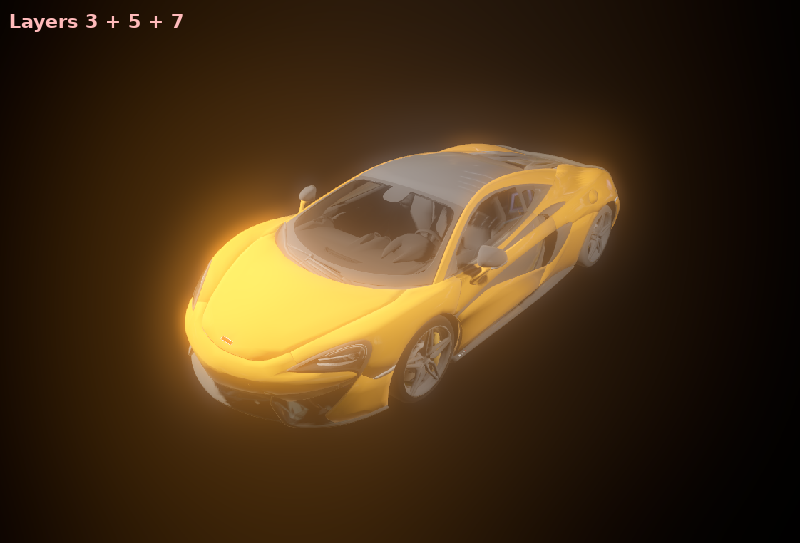 While Godot supports three sources of reflection data (Sky, ReflectionProbe, and GIProbe), they may not provide enough detail for all situations. Scenarios where Screen Space Reflections make the most sense are when objects are in contact with each other (object over floor, over a table, floating on water, etc). The other advantage (even if only enabled to a minimum), is that it works in real-time (while the other types of reflections are pre-computed). This can be used to make characters, cars, etc. reflect on surrounding surfaces when moving around. Max Steps determines the length of the reflection. The bigger this number, the more costly it is to compute. Fade In allows adjusting the fade-in curve, which is useful to make the contact area softer. Fade Out allows adjusting the fade-out curve, so the step limit fades out softly. Depth Tolerance can be used for screen-space-ray hit tolerance to gaps. The bigger the value, the more gaps will be ignored. Roughness will apply a screen-space blur to approximate roughness in objects with this material characteristic. 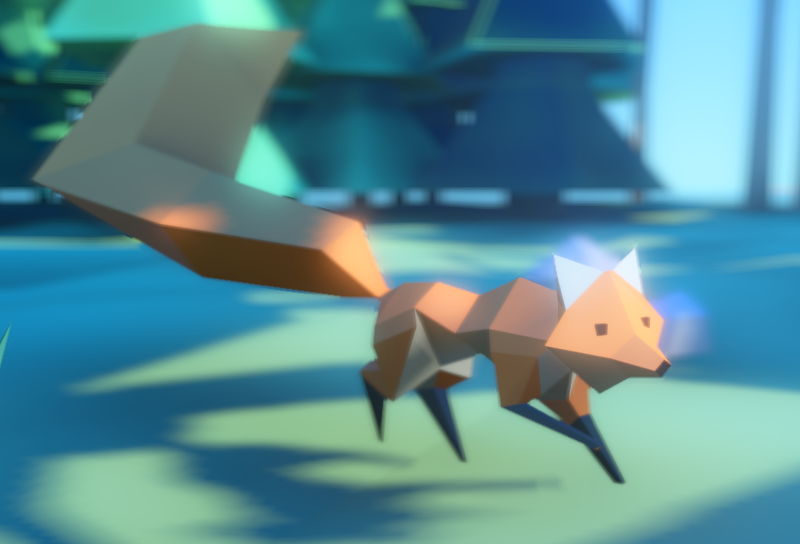 Keep in mind that screen-space-reflections only work for reflecting opaque geometry. Transparent objects can’t be reflected. As mentioned in the Ambient section, areas where light from light nodes does not reach (either because it’s outside the radius or shadowed) are lit with ambient light. Godot can simulate this using GIProbe, ReflectionProbe, the Sky, or a constant ambient color. The problem, however, is that all the methods proposed previously act more on a larger scale (large regions) than at the smaller geometry level. 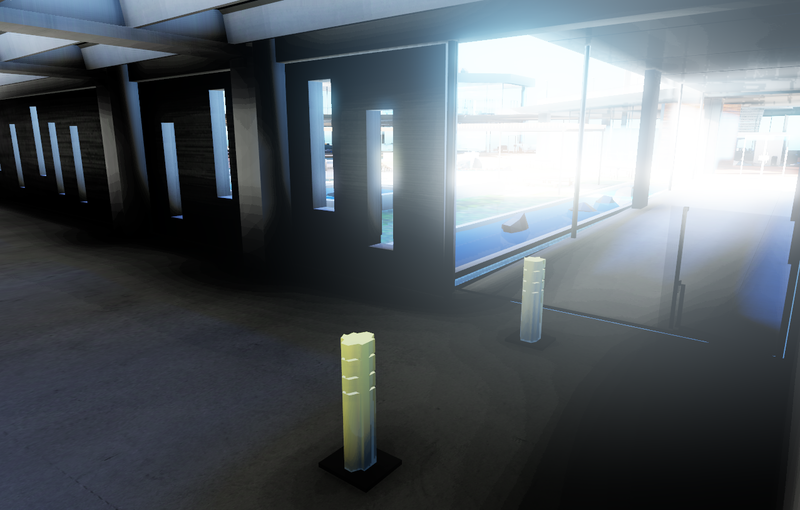 Constant ambient color and Sky are the same everywhere, while GI and Reflection probes have more local detail, but not enough to simulate situations where light is not able to fill inside hollow or concave features. It is a common mistake to enable this effect, turn on a light, and not be able to appreciate it. This is because SSAO only acts on ambient light, not direct light. This is why, in the image above, the effect is less noticeable under the direct light (on the left). 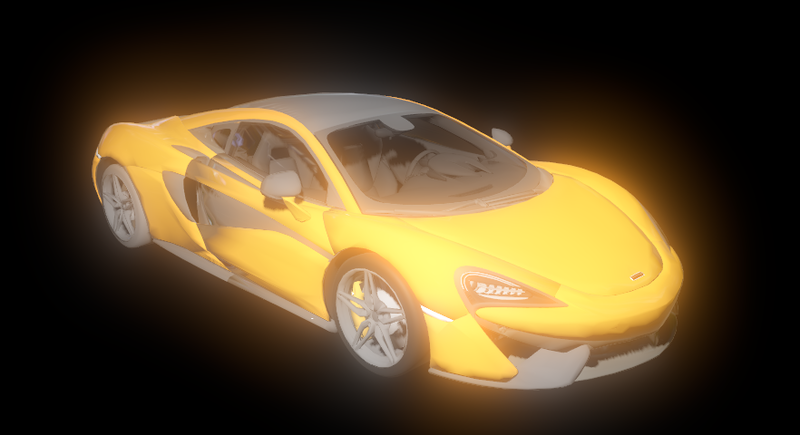 If you want to force SSAO to work with direct light too, use the Light Affect parameter (even though this is not correct, some artists like how it looks). Radius/Intensity: To control the radius or intensity of the occlusion, these two parameters are available. Radius is in world (Metric) units. Radius2/Intensity2: A Secondary radius/intensity can be used. Combining a large and a small radius AO generally works well. Bias: This can be tweaked to solve self occlusion, though the default generally works well enough. 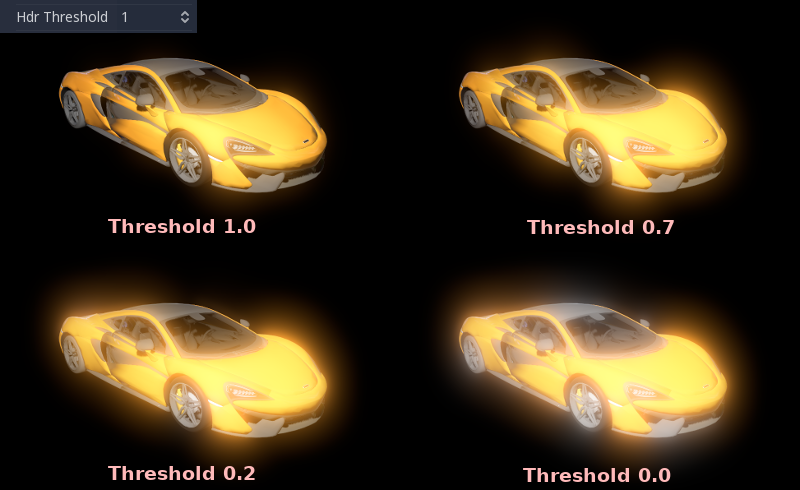 Light Affect: SSAO only affects ambient light, but increasing this slider can make it also affect direct light. Some artists prefer this effect. 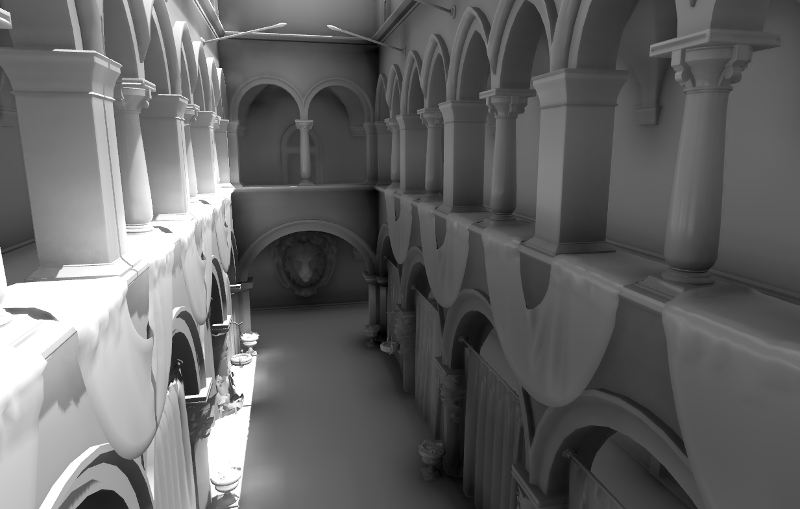 Quality: Depending on quality, SSAO will take more samples over a sphere for every pixel. High quality only works well on modern GPUs. Blur: Type of blur kernel used. The 1x1 kernel is a simple blur that preserves local detail better, but is not as efficient (generally works better with the high quality setting above), while 3x3 will soften the image better (with a bit of dithering-like effect), but does not preserve local detail as well. Edge Sharpness: This can be used to preserve the sharpness of edges (avoids areas without AO on creases). The Amount parameter controls the amount of blur. For larger blurs, tweaking the Quality may be needed in order to avoid artifacts. In photography and film, when light amount exceeds the maximum supported by the media (be it analog or digital), it generally bleeds outwards to darker regions of the image. This is simulated in Godot with the Glow effect. The light in a pixel surpasses the HDR Threshold (where 0 is all light surpasses it, and 1.0 is light over the tonemapper White value). 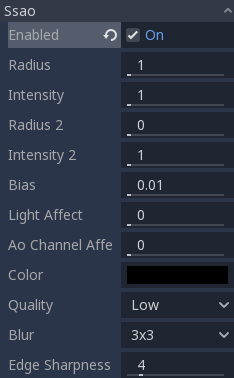 Normally, this value is expected to be at 1.0, but it can be lowered to allow more light to bleed. 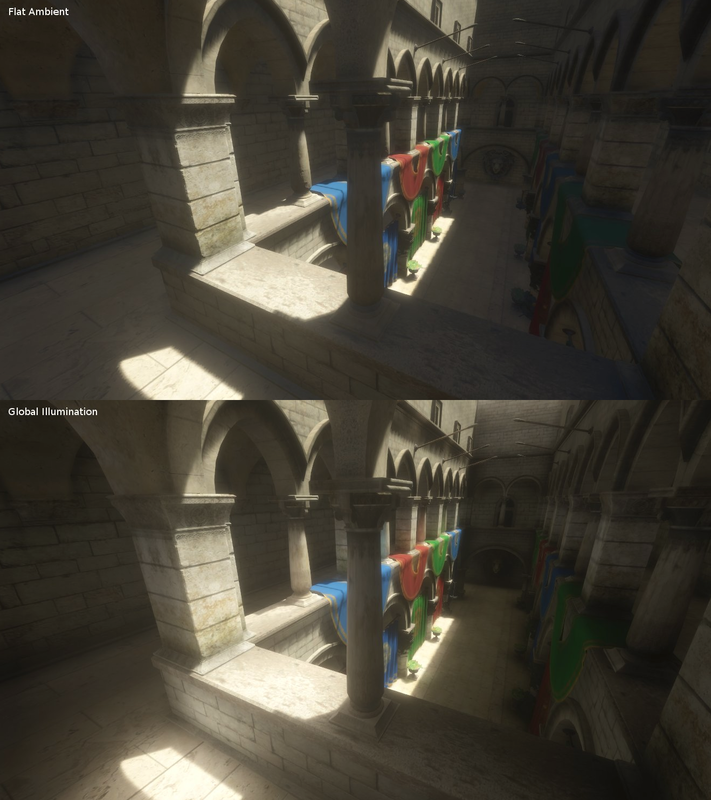 There is also an extra parameter, HDR Scale, that allows scaling (making brighter or darker) the light surpassing the threshold. 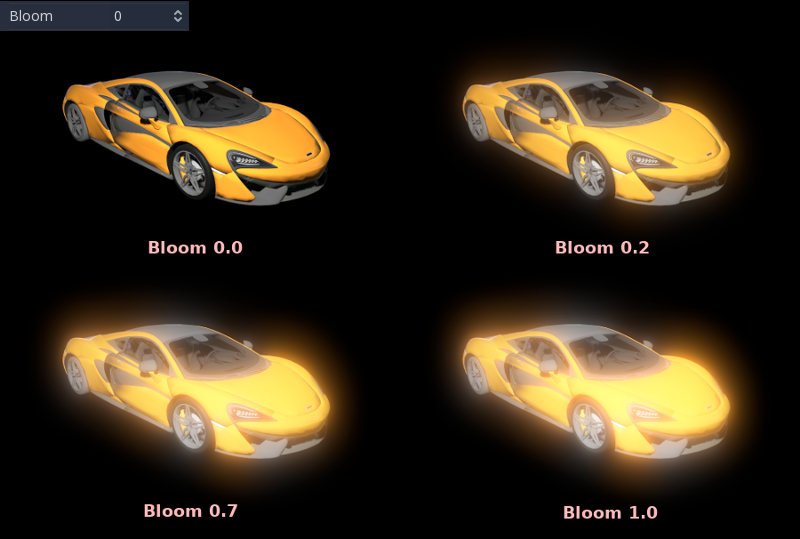 The Bloom effect has a value set greater than 0. As it increases, it sends the whole screen to the glow processor at higher amounts. Both will cause the light to start bleeding out of the brighter areas. Intensity is an overall scale for the effect, it can be made stronger or weaker (0.0 removes it). Strength is how strong the gaussian filter kernel is processed. Greater values make the filter saturate and expand outwards. In general, changing this is not needed, as the size can be more efficiently adjusted with the Levels. Additive is the strongest one, as it just adds the glow effect over the image with no blending involved. In general, it’s too strong to be used, but can look good with low intensity Bloom (produces a dream-like effect). Screen is the default one. It ensures glow never brights more than itself and works great as an all around. Softlight is the weakest one, producing only a subtle color disturbance around the objects. This mode works best on dark scenes. Replace can be used to blur the whole screen or debug the effect. It just shows the glow effect without the image below. Finally, as the highest layers are created by stretching small blurred images, it is possible that some blockiness may be visible. Enabling Bicubic Upscaling gets rids of it, at a minimal performance cost. At the end of processing, Godot offers the possibility to do some standard image adjustments.